Some world leaders begin their tenures with high favorability ratings – only to see their popularity fall over time. But, in the U.S., Pope Francis remains as popular as ever, with seven-in-ten Americans saying their opinion of the pontiff is “very” or “mostly” favorable, according to a new Pew Research Center survey. When Francis began his papacy in March of 2013, 57% of Americans held a favorable view of him, while 14% held an unfavorable view and 29% couldn’t give him a rating. 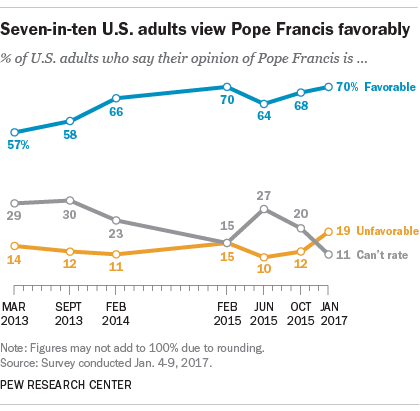 Now, seven-in-ten Americans express a favorable view of Francis, while 19% express an unfavorable opinion and just 11% say they don’t know enough to be able to rate the pontiff. Not surprisingly, Pope Francis is even more popular among U.S. Catholics than he is among the public as a whole, with eight-in-ten or more American Catholics routinely giving the pope favorable ratings. Currently, 87% of Catholics express a favorable view of the pope. Opinions vary widely among non-Catholics. About half (53%) of white evangelical Protestants now view Francis favorably, roughly similar to the 59% who did so in March 2013, when he began his papacy. Among religious “nones” – those who describe their religious affiliation as atheist, agnostic or “nothing in particular” – 71% have a “very” or “mostly” favorable view of the pope, substantially higher than the 39% who felt positively about Francis in March 2013. Some of this change has come from those who originally had no view of the pope. Indeed, about one-third (34%) of religious “nones” could not rate Francis in March 2013, while just 10% don’t offer an opinion today. 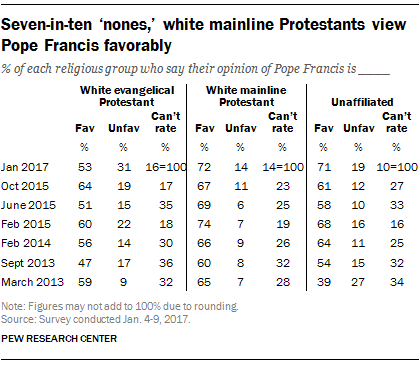 Francis enjoys a similar level of popularity among white mainline Protestants, with 72% of the group saying they have a favorable view of him, little changed from previous years. Continued positive views of Pope Francis among Catholics approach Pope John Paul II’s highest ratings from Catholics in the 1980s and 1990s. 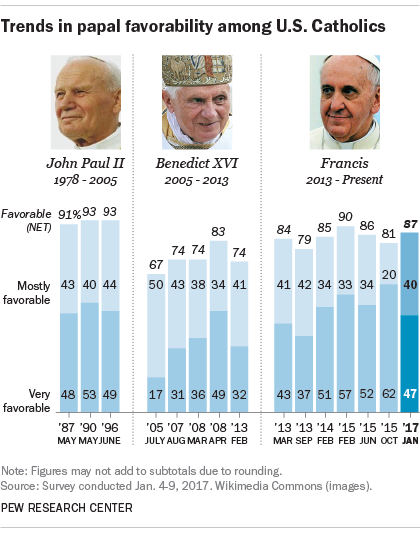 At the same time, Francis’ favorability ratings tend to be somewhat higher than Benedict’s were during most of his time as pope.